I know it's not fall yet, but we've had some unseasonably fall like weather recently which has had me craving certain comfort foods. And at the farmers market a couple of days ago I saw sweet potatoes, winter squash and just a few small pumpkins! I didn't buy any yet, but it made me remember the canned pumpkin in my pantry that I hadn't used. And I hadn't made these muffins for a few months so I remedied that real quick. These Pumpkin Muffins have become a family favorite since I first made them last year. My son downed about 5 of these moist and spicy muffins when he spied them! His girlfriend gladly took some home with her also. It's a good thing this makes a large batch! These tasty muffins freeze well; I just wrap them individually and place in freezer bags in the freezer. At this rate though, I'm not going to have any left to freeze! In a large bowl add the sugar, eggs, oil, water and pumpkin and beat well. In another bowl, combine flour, baking powder, soda and spices and blend into the pumpkin mixture. Do not over mix. Spoon batter into greased muffin tins, or paper liners, filling about 3/4 full. 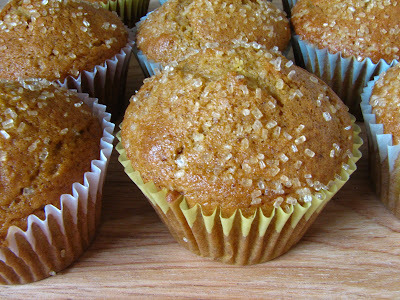 If desired, sprinkle tops of muffins with course sugar or chopped nuts. Bake in a preheated 400 degree oven for about 15 minutes. This makes about 27 muffins, which is a good thing in this family! These muffins are so moist and addictive! Yes, you can add nuts and raisins to the mix, but my family won't eat them if I do, so I adapted the recipe to our tastes. Enjoy! Lynda- the same has been happening here with the weather and craving of fall like comfort foods. Pumpkin tops my list of fall flavors I crave- this recipes looks wonderful. Thanks. Good thinking. I have a leftover can of pumpkin that needs to be used up too! Lynda, this DOES sound so very good! Will save for cooler weather. Nothing like a beautiful muffin with melted butter. Such warm and happy flavors in this! I don't know if I'm ready for fall yet, but I'm always ready for recipes like this! I hear you on being ready for fall, it's so hot and humid here I'm so looking forward to cooler weather. Your muffins look terrific! I stumbled upon your blog and I'm so glad I did! These muffins look killer :) I love the coarse sugar on the top, adds an element of crunchiness! This is yummy :) I don't think I can find can pumpkin here only fresh one. Nothing says fall like pumpkin. I am loving these muffins! We've had a touch of fall also. No hot weather. (???) And these are the perfect thing for a cool morning. Scrumptious! I love pumpkin any time of the year. These look perfect! These looks perfect with a cup of coffee at breakfast..
i definitely associate all things pumpkin-related with fall, but that certainly wouldn't keep me away from some fragrant and spicy muffins! i love the sugary crust on top! It is going to be hotter than poo around here, but I will save this recipe for fall! thanks for sharing. Hurry up fall! My favorite season...I would love to eat a couple of these to get me into the mood! Pumpkin muffin sounds and looks delicious...love the ingredients in it!